Here's an addictive multiplication/factor game that I'm sure you will enjoy! Two players take turns to play. 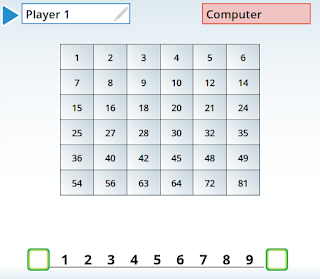 The first player chooses a factor from the list of numbers at the bottom (by moving the slider on it). The 2nd player then chooses another factor, and he gets the PRODUCT of those two factors (it is colored on the board). Then back to the 1st player... he will MOVE one of the sliders to a new number, but the other slider stays. 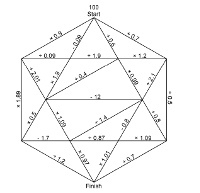 The 1st player gets the number that is the PRODUCT of the two factors. And so on. The winner is the person who gets FOUR squares vertically, horizontally, or diagonally in a row. Check out these videos of mine on telling time, meant mostly for grades 2-3, but I will be adding some for 1st grade hopefully soon. Use a calculator, and try to finish with the largest value possible. Looks like FUN!